Mannheim, 31 May 2017. Röchling SE & Co. KG (Mannheim) continued its record of success in the 2016 financial year and the first quarter of 2017. For the first three months of the current financial year, the Röchling Group increased its sales by 15.1% to €474.6 million. “Our investments have paid off. All three divisions got the new year off to a good start. In particular, the Automotive Division made another strong contribution to our growth. There, higher demand in Western Europe and China accounted for the positive development. The Industrial Division benefited from a healthy economy in its key markets,” said Ludger Bartels, CEO of the Röchling Group. The Röchling Group boosted its consolidated revenue for the 2016 financial year to a new record. It grew by 6.6% to €1,657.4 billion (prior year: 1,555 billion). For the 2016 financial year, there was also an increase in the number of employees at the Röchling Group, which rose 5.0%, from 8,397 in 2015 to 8,815 (including temporary employees as of the reporting date of December 31, 2016). The Röchling Group had 229 trainees and apprentices for the reporting period (prior year: 205). Those individuals are being trained for a range of professions, from administration to production to studying at the Duale Hochschule (Dual study programs). The largest share of total sales is contributed by the Automotive Division, 41% comes from the Industrial Division and 7% from the Medical Division. The Röchling Group increased its earnings before taxes (EBT) by €13.3 million. That put the EBT margin, defined as the ratio of EBT to total sales, at 7.4% (prior year: 7.1%). According to Ludger Bartels, “The reasons for this profitable business year include the fact that we have dealt with our challenges consistently and systematically. We pursued our strategic goals without wavering and with intensity, and we further expanded our international presence – for example, by opening our first production plant in Silao, Mexico.” The Röchling Group also stepped up its investments for the 2016 financial year. Capital spending grew by €41.5 million, from €89.7 million to €131.2 million. Of the total volume of investment, 80.5% was spent on expansion (prior year: 71.8%). The Industrial Division maintained its steady pace of growth from previous years. All told, the division saw a 1.9% increase in sales to €684.4 million. According to Franz Lübbers, Executive Vice President of the Röchling Group’s Industrial Division, “We managed to boost our sales volume considerably, but because of the extreme volatility in the cost of our raw materials and the resulting fall in sales prices, we failed to meet our expectations.” The Industrial Division also felt the effects of the low oil price on its sales markets. In North America, the UK, and Denmark – the countries where important oil production equipment suppliers are based – there was serious restraint in spending in 2016. Customers from other industrial sectors, such as Chemical industry, mechanical engineering, electrical, and electronics, made up for only part of the resulting drop in sales. There was very positive growth in demand from the solar energy and from the leisure industry. “We are especially pleased to see the overall positive development of the Industrial Division from an international standpoint. In Brazil, the division increased sales by 17%, in China by 16%, in Japan by 32%, and in India by 14%,” said Lübbers. The Industrial Division had capital expenditures of €41.2 million for 2016, €9.7 million more than the previous year. The investments were again focused primarily on expanding capacity in the US, at four locations in Germany, and in Austria. “Besides increasing our capacity and optimizing our processes, we are persistently adhering to our innovation strategy. For instance, we have further expanded our market position with new and innovative products in every sector,” stated Lübbers. In addition, the division unveiled new and advanced materials in 2016. For example, Röchling in Haren developed Polystone® P flex especially for the production of chemical tanks and plants. With its high elasticity, good resistance to chemicals and weldability with polypropylene, thermal and mechanical expansion can be compensated already during construction. In addition, the LubX® high-performance sliding material was given antistatic properties. LubX® AST black and now the world’s first colored version, called LubX® AST color, are specially conceived for use in conveyor systems that are run at high speeds and with high pressure loads, resulting in increased productivity. For the conversion of the first German container ship to an eco-friendly propulsion using liquefied natural gas (LNG, -164 °C), Röchling is contributing low temperature insulation made of Lignostone® cryogenic. The Automotive Division generated sales of €855.9 million for Röchling, a 10.1% increase in revenue over the €777.5 million earned last year. Viewed as a whole, nearly every region covered by the division saw increased sales compared to the figures for the prior year. Only the Asia Region posted a slight drop in sales, mainly attributable to currency effects. Erwin Doll, the member of the Management Board in charge of the Automotive Division, said, “We executed the Automotive Division’s growth strategy at a rapid pace. We built a new facility in Silao, Mexico, and we carried out expansions in Ostrava, Czech Republic, and Wackersdorf, Germany.” On top of that, new engineering centers were opened at our locations in Laives, Italy, in March 2017 and in Worms, Germany, in May 2017, laying the foundation for innovative growth. The company opened its new US-based technical center in Troy, Michigan, back in March 2016. Its facility in Peine has also been expanded to include a new production hall. New facilities are being built in Spain, China, and Eastern Europe, and the site in Romania is being expanded. Altogether, the Automotive Division increased spending from €49.9 million in 2015 to €79.3 million in 2016. Once more, active grill shutters and underbody systems, as well as products for air and water management, were particular drivers of growth. In the future, Röchling Automotive’s expertise in SCR technology will help it become the market leader in the segment of SCR tank systems, giving an added strong boost to the growth of the division. With the aid of this technology, catalytic converters remove up to 90% of nitrogen oxides from the exhaust of diesel vehicles. This makes SCR technology part of the solution to the problem of emissions. At our facility in Laives, we develop SCR tank systems for nearly every automobile manufacturer and are either already producing or will be producing them in ten factories around the world. Furthermore, the Röchling Group landed new orders in China. In that county, the Automotive Division benefited particularly from the fact that Chinese automobile manufacturers are increasingly generating sales and acquiring more market share with affordable SUVs. For example, BAIC, one of the largest local car companies, commissioned Röchling Automotive for the first time to develop and produce active grill shutters. Another first-time order was placed by the Sino-European automobile manufacturer Chery Jaguar Land Rover. Röchling Automotive will be producing noise-reducing engine covers for a new mid-size model at the facility in Kunshan, China. In the segment for degas bottles, Röchling in China acquired GAC Fiat Chrysler Automotive as another new customer. The Medical Division, newly established in 2016, also experienced positive growth. Altogether, its three locations in Rochester, NY/USA; Brensbach/Germany; and Neuhaus am Rennweg/Germany, generated sales of €117.2 million, 9.5% higher than the previous year. Individually, the three sites of the division each posted increased revenues. For the 2016 financial year, the division invested a total of €10.4 million. Röchling Group CEO Ludger Bartels, who is also in charge of the Medical Division, said, “We are more than pleased with the growth of the Medical Division.” Thanks to the heavy marketing and expansion of its product portfolio to include closure systems, the company landed new projects that will enable it to invest in modifying and expanding its facility in Brensbach. At its site in Neuhaus, the company began expanding the facility and capacity with an investment of €30 million. That is where primary packaging is produced. “Primary packaging” is the designation used for products that come in direct contact with medications. For that reason, the products require a high level of quality and cleanliness. “Never before has the Röchling Group invested that kind of money at one of its facilities,” says Ludger Bartels. In addition, a new clean room began operation at the facility in Rochester/USA. With the clean room, we were able to purchase five additional injection molding plants for the manufacturing of medical technology products. 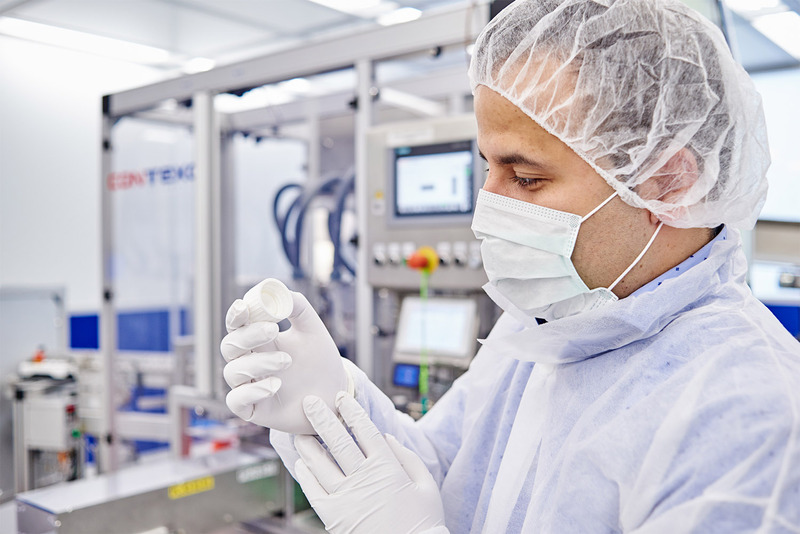 In collaboration with a customer in West Chester/USA, Röchling in Rochester developed battery casing components for a system that allows patients to check their blood sugar levels easily and that has a built-in insulin pump that enables the simple and precise dosing of insulin. Furthermore, Röchling made a significant contribution to the development of a trocar for another company in North America. Trocars are inserted through the abdominal wall into the abdominal cavity during minimally invasive surgeries, such as laparoscopy. The new trocar allows surgeons to visually monitor the process of inserting the laparoscope. The production process involved multiple techniques, including injection molding, assembly, printing, ultrasonic welding, multi-component injection molding, and in-mold processes. Another key to the success of the project was the efficient supply chain management by Röchling. Among other things, metal components had to be procured for the in-mold process.